How do you lessen the chance of your little one developing baby acne with proper hygiene? This is a commonly occurring skin condition that happens to many newborns for seemingly no apparent reason. Although this condition can get bothersome for babies, the good news is it’s temporary and easy to treat. So the basis of this information is to pass on tips to you relating to baby acne proper hygiene. You will gain some valuable information on bathing your baby, preventing acne from developing, and some remedies for treating your baby’s skin in the event this condition does occur. All of this information will serve well in helping you to keep your baby healthy and happy. 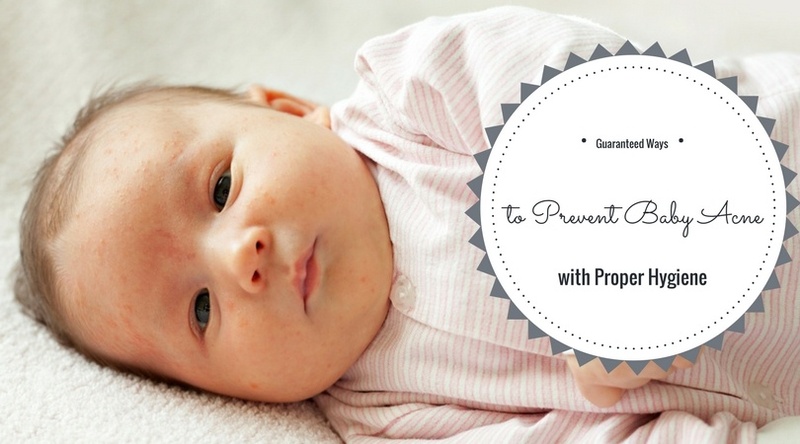 How to Prevent Baby Acne with Proper Hygiene? How Often Should You Bathe the Baby? Right away, you might consider bathing your newborn in the tub every single day perhaps even more than once a day if he or she has a major d﻿iaper episode. Not the best idea! Your newborn’s skin is much thinner than your own which makes it especially sensitive to any dyes, fragrances, or even just frequent cycles of wetting and drying. For the most part, if you are quick to clean the face and neck after the baby spits up or drools, then he or she is less likely to develop acne or any other condition. Then, you will repeat this step, but remember to dry the baby off immediately and keep him or her wrapped well. However, you might consider being prepared in the event your baby develops acne. Of course, if you are not sure whether or not a skin condition is acne, or if other symptoms, like fever accompany the appearance of blemishes or rash, then you should contact your pediatrician immediately. Basically, there are products out there that can help with this skin condition, but of course, good hygiene habits are the safest option for your baby. So all bases have been covered from exactly how and how often to bathe your baby to prevent acne or any other skin irritation to products that promote healthy skin. Remember that keeping your baby clean and free of skin conditions is part of maintaining good health and wellbeing for your baby. And starting this habit in the early days shortly after birth is quite simple. Do you have some tips or questions of your own to share? We’d love to hear from you. Baby Swallowed Bath Water: How alarming is this? 7 Tips to Keep Baby Skin Healthy: Worry No More! How Much Eye Contact is Normal for Babies? Can you let me know the homemade natural way to remove baby acne?